The AM4112T handheld microscope views with natural color reproductions and also provides bright and clear images at high magnifications. It can magnify objects from 20x~50x, 200x depending on working distance without changing a single lens giving the versatile performance needed built into a small handheld package. There is also a MicroTouch II trigger to turn on or off the built in lights giving you the freedom of supplying your own light source. When a computer is not accessible, this is where the AM4112T Dino-Lite handheld microscope succeeds. 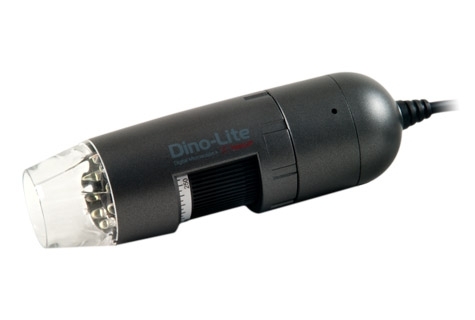 It connects to a television with composite video output at resolution of 640x480 pixels, and includes a power adapter to power the Dino-Lite. It's available in either NTSC or PAL video standards depending on the region you live in.